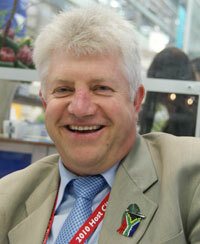 After a bad start, being blocked by PA's or media staff, I finally met Alan Winde at Indaba. I walked up to him, asked for a meeting and we sat down an hour later. So much for “assistants” when they become impediments to getting things done. When Calvyn Gilfellen, CTRU CEO, heard I was meeting Winde, he said, “He’s a very jovial guy, so don’t be confrontational with him.” I told Alan about this and he laughed, saying he would have just joked with me if I had. And that makes a second point worth noting: what’s confrontational to some is just banter to others. Alan also made the point repeated during the discussion that it’s the media’s job to ask difficult questions and raise concerns over issues. So yes, we got off to a great start. Yes, he’s also a politician so it’s expected that he has the ‘gift of the gab’, but how refreshing to hold a discussion with someone intelligent and an understanding of what needs to be done – without being prompted. He started off by talking about the need for tourism products that “grow patriotism” and spoke about a meeting he’d recently attended with South Africa’s deputy-president. Kgalema Mothlanthe had said that “we can only be a nation when we own each other’s histories” – something Alan took to heart. It struck a chord because he’d been instrumental in getting a Heritage Tour Route going in Nyanga, with poets, music, dancers, heritage sites (like Miriam Makeba’s old house) and more. He’d been approached by someone with the idea for the route, and then he asked about its progress every month until he was asked to attend its opening. Alan was on a roll… he went on to talk about an initiative with Robin Carlisle (Western Cape transport minister) and Chris Wells (Transnet acting CEO). “If you arrive at the Swiss border in a truck and you want to drive across the country, you and the whole truck are diverted onto a train and you continue your journey by rail,” he says. And that’s what they want to see here. Heavy road traffic is damaging SA’s roads and makes driving on national routes hazardous and very unpleasant. There are already bogeys in Johannesburg that monster trucks can drive right onto, and Transnet has 100 new engines on order. But the trucking industry (which hardly existed 20 years ago in its present size and form) now has a significant impact on the local economies of many towns. So a comprehensive economic study is being undertaken to look at the impact and how best the transition can be made. But that’s not where the attention on rail should stop, he says. There are the Outeniqua Choo-Tjoe and the Franschhoek and Elgin tourist trains, for example. When Maria Ramos turned Transnet back to its core business – moving freight – the opportunities presented by the services that were cut were never properly explored. “The Outeniqua Choo-Tjoe was costing R19 million a year, but only generated R9 million pa. No one looked at opening the train up where, for example, coaches could be owned by a hotel group while other coaches could be used for backpackers. “We’re looking at other uses for non-core railway lines as new tourism products. Imagine if a new rail line was to be built from George Airport for the Outeniqua Choo-Tjoe? We’re looking at leasing an unused rail line up the West Coast and then sub-leasing it to the private sector for new tourism products. With government and parastatals, that’s the only way to get things going. That wasn’t idle talk because it is a directive he repeated in the next two days while visiting the Western Cape exhibitors. I gate crashed one discussion he was having with a Western Cape group (which included Nils Heckscher) where the challenge of raising tourism above political interference was being discussed. In our meeting, he had said that changes in provincial and city political control must have no impact on tourism structures. This brings us to the bane of successive tourism ministers in the Western Cape – Cape Town Routes Unlimited (the provincial body) and its relationship with Cape Town Tourism. One of his first actions as minister was to call a meeting of some 30 people from Cape Town Routes Unlimited (the provincial tourism agency) and Cape Town Tourism. He asked everybody to answer one question – Is there a problem with current tourism structures? If they answered "yes", the meeting would go on. If they answered "no", the meeting would end and they could all go back to their offices. Everybody agreed that there are problems. So he gave CTRU and CTT nine months to jointly come up with a suggestion that would work… and be above political interference. Without any clear solution at the end of this nine month period, he announced that he was taking control of the way forward and that future meetings would be chaired alternatively by him and Felicity Purchase, his political counterpart in the City. Will he be successful or is it just more talk? He is an entrepreneur (or was) having being instrumental in the start-up of ten businesses in Knysna. He doesn’t need tourism officials to guide him because he sees more opportunities and ways of getting things done than most bureaucrats ever can. He admits that things do take time in government. But there's not the fuzzy politically-inspired thinking that predominates elsewhere and he's shown that by repeatedly asking the right questions, things do get done.